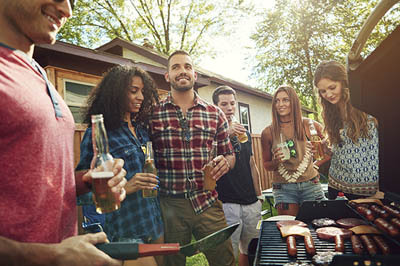 Nicer weather is rolling around again and we can all look forward to spending more time outdoors, including family picnics, summer holiday parties and clean eating BBQs with friends! With all this summertime fun, it can be tempting to dive into foods you wouldn’t normally indulge in for convenience sake. No need, with our three clean eating recipes. 1. Skip the chips. Big bowls of chips are a classic munch at outdoor parties, and they do go well with an ice cold beer and a sandwich off the grill. But you’re better off skipping the chips and going for a different crunch side dish like a salad. Try our spicy slaw recipe! 2. Take off the toppings. You might be offered a fresh, healthy bounty of summer party foods–bright fruits, seasonal veg, lean grilled meats. Don’t give in to bacon on your burger, cheese spread on your beef, whipped topping on your fruit salad, and so on. 3. Watch the sauce. Condiments can be processed food culprits at a bbq buffet. What starts out as a clean eating main dish can end up smothered in sauces with too many ingredients. Try lemon on fish, tomato on steak, and our yummy bbq sauce recipe! 4. Leave the bun behind. Unless there are no plates to be had, there’s no reason to eat your burger on a bun or your chicken salad on a sandwich. Go straight for the protein or make it open-faced to cut back on the packaged bread. Try our chicken wrap recipe too! 5. Avoid a lot of alcohol. It might seem obvious, but it’s worth repeating: if you’re trying to lose weight, eat healthy or get fit, alcohol is a special occasion treat at most. Limit beer and wine, and especially beware of sugar-filled tropical mixed cocktails like margaritas and strawberry daiquiris. Whisk lime juice, oil, honey, salt and pepper in a large bowl. Add the coleslaw mix, onions, jalapeno and cilantro. Mix well to coat all the cabbage, cover and chill for an hour or more before serving. Whisk all ingredients except olive oil in a saucepan, bring to a low boil and continue to boil for 3 minutes. Remove from heat and stir in olive oil. Serve warm or let cool slightly before refrigerating. Makes about 2/3 cup of sauce. In a medium bowl, mix first five ingredients till well blended into a sauce. Add chicken breast slices and stir to coat. For each spring roll, dip one rice sheet in warm water for several seconds until it starts to soften. Lay rice sheet flat and layer on a two inch wide strip of spinach leaves on the edge nearest you. Add 1/6th of the chicken, carrot, cucumber and avocado strips. Then layer on 1/6 of the noodles and sprinkle with cilantro. Roll up the rice sheet and fillings, starting with the edge nearest you under the spinach. Tucking in the ends is optional; rolls can also be left open to show fillings. Repeat for each remaining rice sheet. If not eating immediately, cover and keep in refrigerator.